There is only one cloud silhouette, and it is this one. Then why is it on feature parity with Facebook? If it’s just an update to Google’s other services, why is it its own service? Mr. Musk then bet me $1 million that he would do it and, graciously acknowledging our rather different financial situations – he’s wealthy and I’m not – said the bet would be only $1,000 to me. In either case, he wrote, the winnings would go to the charity Doctors Without Borders. Seeing this as a rare opportunity to facilitate a $1 million donation to a worthy cause, I accepted. This article will probably disappear behind the Wall Street Journal‘s paywall by tomorrow, so grab it while it’s hot. Oh, Netflix Is Down? I’ll Just Update My Pinterest Then. Wait, What? An outage of Amazon’s Elastic Compute Cloud in North Virginia has taken down Netflix, Pinterest, Instagram, and other services. According to numerous Twitter updates and our own checks, all three services are unavailable as of Friday evening at 9:10 p.m. PT. Amazon’s service health dashboard indicates that there are power issues in its North Virginia data center, most likely caused by severe storms in the region. The outage underscores the vulnerabilities of depending on the public cloud versus using your own data centers. I bet most people don’t realize that these services are all connected. I’m surprised that Amazon doesn’t have redundant data farms. Good question. When does Google, or indeed any company, cross the creepy line? This seems to be a very personal question. Some people don’t care about Google’s silos of personal data, while others avoid that at any cost. That Google Now knows when I commute and for how long feels like it crosses that line. 64 new tech products are purchased every second all around the world. Woah. Confusing PR-speak to English translation: Android 4.1 will not have Flash support. If only iOS also had Flash, then this announcement might pertain to it, too. As senior vice president of Hardware Engineering, Mansfield has led Mac hardware engineering since 2005, iPhone and iPod hardware engineering since 2010, and iPad hardware engineering since its inception. As part of its financial earnings report for Q1 2013, RIM has revealed that BlackBerry 10 has been delayed until the first quarter of 2013. RIM officially revealed the new OS back in May at BlackBerry World, and CEO Thorsten Heins said that the project had been underway for a year and a half — but it looks like the company will need even more time to deliver. I’m linking to another iteration of this just to use the cheesy headline pun. In all seriousness, it must be rough for the 5,000 employees they need to let go. I feel for them, as their departure ultimately isn’t their fault. Bookmark syncing is something longtime Chrome users are going to love. Since iOS doesn’t let users set a default browser (or default app for anything), it’s going to be an awkward experience on iOS. This will probably increase the number of requests for this feature. Why not let Sparrow be the default email app, if the user so chooses, or Chrome be the default browser? Update: The best feature of Chrome for iOS, by far, is a menu option to request the desktop site, rather than a crappy mobile site. Nice. A very smart combination of some Siri-like functionality with Passbook elements, and a few things all Google’s own. I particularly like the transit card, which shows the next trains and buses nearby. Very clever. Apple will unveil the changes by year’s end, said the people, who asked not to be identified because the plans aren’t public. The company will more closely integrate its iCloud file- storage service with iTunes so users can more seamlessly access and manage their music, videos and downloaded software apps across different Apple gadgets, the people said. As for the iCloud integration, it is said to make it easier for users to manage their files. 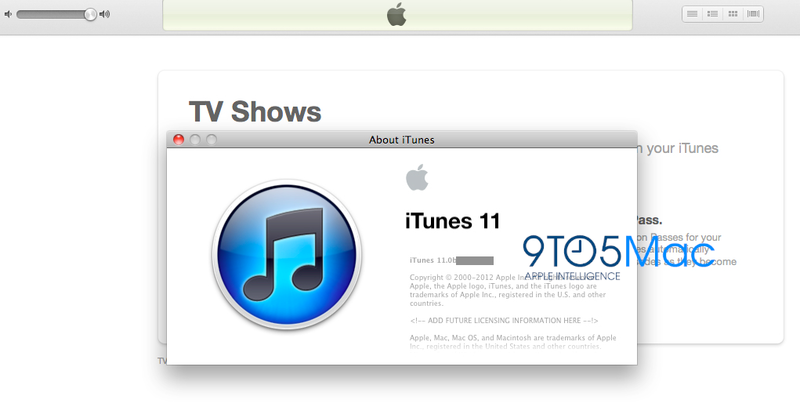 We showed you a screenshot of the iCloud integration within an early build of iTunes 11 back in April. If you follow that link, you will see this screenshot of an info box, a version string, and nothing more. In what way is this a “screenshot of the iCloud integration”? Meet Nexus Q, the first social streaming media player. […] It’s the first device that lets you create social playlists with your friends. Apple steals a notifications concept from Android circa 2009. Google steals an iTunes concept from 2009. It all comes out in the wash, doesn’t it? Both Amazon and Google are pitching these devices not as computer-replacements, but content hubs. Apple, on the other hand, wants users to think of the iPad in both ways. Etched into the base of Google’s new wireless home media player that was introduced on Wednesday, is its most intriguing feature. The biggest challenge in bringing manufacturing home has been finding component suppliers nearby. Industry executives note that the decision to stay in China is often determined by the web of parts suppliers that surround giant assembly operations, like the one that Foxconn, the manufacturing partner of Apple and many other big electronics companies, operates in Shenzhen. The advantages can be striking. A design change made in a product might be executed in a few hours. Google Now tells you today’s weather before you start your day, how much traffic to expect before you leave for work, when the next train will arrive as you’re standing on the platform, or your favorite team’s score while they’re playing. The underlying data for this is your Google products activity history. On the one hand, it’s disconcerting that Google has all this information, but on the other, it’s incredible to see its contributions to new products.. The promo page for Now isn’t up yet, but it should be worth waiting for. So it looks like the Java VM can yield buttery smooth animations… it just need a 4-core processor and 12-core GPU to do it. The update will apparently be available next month to three devices. I guess some things don’t, or can’t, change. Google released a 7-inch Nexus tablet, to be made by ASUS, and you’ve already heard everything about it. It looks like a solid Kindle Fire competitor. Of note, it only has a front-facing camera, and that camera is only for video chat. Good to see Google has the balls to admit that taking pictures with a tablet is stupid. A pair of beta Google Glasses costs $1,500 and will start shipping to I/O attendees next year. Next year, and only for US developers. It’s a piece of technology I’m not sure I get. It’s exciting, but it feels premature to even announce it, let alone ship a developer preview. That’s the only way to explain the strangely vitriolic response to his new show,”The Newsroom,”which premiered Sunday night to a round of mixed to splutteringly negative reviews. Many critics, including this one, objected to Sorkin’s decision to sacrifice the quality of the narrative in order to hit certain talking points — mostly about the state of journalism, the state of politics and the vicious dumbing down of American culture. Much of this controversy seems to be a rushed defence out of denial. People in the news don’t like to see their medium get such a damning presentation. People in any profession that has fallen from grace wouldn’t like to see that. For what it’s worth, I found the first episode to be a phenomenal piece of television, and I look forward to the rest of the series. Coda 2.0.1 remains “In Review”, so here a sneak peek at a license migrator we’re tinkering with. Good idea? Smart move on Panic’s part, though it’s a shame it’s come to this.